Transient expression in preameloblasts before the onset of secretion of enamel matrix.. Expression first visible in polarized odontoblasts..
Discrepancy between immunostaining and in situ hybridization..
DSP is highly specific for the odontoblast lineage: not seen in bone, bone cells or cementum, cementum cells, and only very transient functional expression in preameloblasts. (Text by A.L.J.J. Bronckers). DSP is expressed from the same transcript as dentin phosphoprotein. 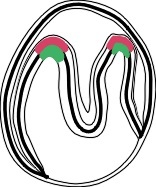 Similar expression in rat tissues. Data last edited 03.03.1999 by M.P., page last created 10.12.2004 by P.N.